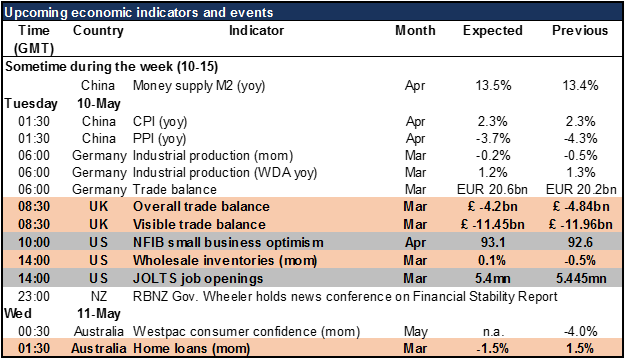 UK Trade,US Wholesale Inventories, Australian home loans – Much of the important data for today is already out: the China CPI, German industrial production, and the German trade balance. The German trade balance, while not particularly market-moving, is worth noting anyway, because of how it helps to explain much of what else is going on in the world. German officials and the public have recently been complaining about the ECB’s negative interest rate policy, but those complaints ignore how greatly their country benefits from the cheap euro, a side-effect of that same policy. However, we mustn’t forget that one country’s trade surplus is another country’s trade deficit. 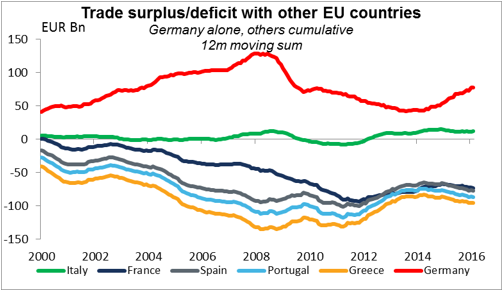 In fact, Germany’s enormous trade surplus is a major source of the imbalances within the Eurozone that are forcing the ECB to keep interest rates so low. If Germany would do something to rectify this enormous imbalance, such as increasing investment, then perhaps the ECB wouldn’t need to keep rates so low. Just FYI, Germany ran a current account surplus in 2015 of 8.4% of GDP. That’s more than double China’s 3.1% or Japan’s 3.3%. 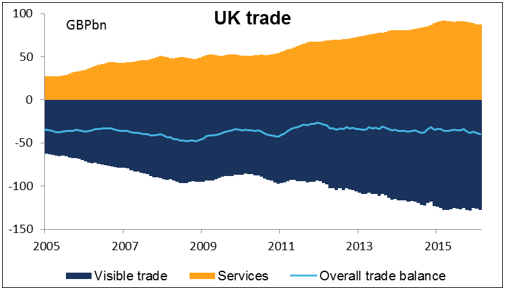 Speaking of trade, the next statistic out today is the UK trade data. The visible trade deficit is expected to narrow somewhat and the overall trade deficit is expected to narrow a bit more, implying that the market thinks the services surplus is likely to rise.That would be good news but whether it would be good enough to boost GBP is another question. The Bank of England meeting this week will bring another quarterly Inflation Report with updated economic forecasts. The Bank is likely to revise down its forecasts, which could lead to GBP weakness. I think it would take a larger improvement in the trade deficit to outweigh that fear in investors’ minds.